Rugby Borough joint Managers Darran Tank and Ady Fuller have signed an agreement to stay at the club for the next 12 months. The duo have guided the club to promotion in this, their inaugural season, and are looking forward to playing at Step 7 of the non-league pyramid for season 2018/19. “We’ve had a fantastic first season and couldn’t have asked for a better result,” said Tank. 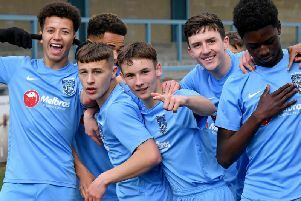 “The links with Rugby Town Juniors and the Strachan Football Foundation have been a gift for us really, which me and Ady have taken full advantage of. We must have played over a dozen of their lads this season. The Rugby Borough board issued a statement saying: “We are delighted that both Darran and Ady have decided to stay with us for another year. # Borough will be promoted to the Leicestershire Senior Premier Division for season 2018/19 and are now planning for that, with a couple of big name local clubs already lined up for pre-season friendlies. Details will be released soon on the club’s website, along with early-bird season ticket discounts. On Saturday afternoon Rugby Borough visited Holwell Sports FC. Borough got off to a rocky start, conceding a goal in the first minute from a deflected free kick, leaving keeper Ashley Bodycote no chance of saving it. It wasn’t until the 44th minute that Borough equalised, Tom Glasscoe volleying home Adam Shaw’s cross at the far post. Then there were two goals inside a minute; one for each side. Holwell went 2-1 up when a corner bounced back off the bar and was volleyed home, but Borough went straight up the other end and Jamie Paye finished Glasscoe’s superb pass. The second half saw Borough take the lead when Shaw headed home Ryan Byrne’s corner. Just four minutes later the lead extended again, Ollie Chater curling a shot into the bottom corner. Two more goals in the last ten minutes from Paye and Shaw saw a 6-2 victory for Borough, who remain top of the table, eight points clear, with five away games still to play.